Utah; Utah State Guide; American Guide Series; New Deal; Works Progress Administration; WPA; Federal Writers’ Project; FWP; Federal Project One; Tourism; Great Depression; Green River; Granite Quarrying; Mormon Temple; Granite. Images of pictures of Green River, Utah and men quarrying granite to build a Mormon temple from “Utah: A Guide to the State”, the Utah State guidebook from the American Guide Series created by the Utah Federal Writers’ Project during the New Deal. Utah State University, Merrill-Cazier Library, Special Collections & Archives, Book Collection 39 no. 44. Page 445. 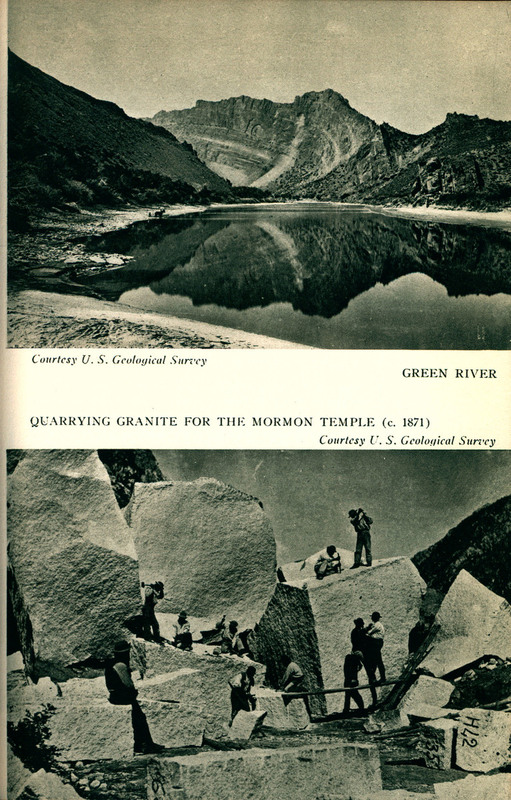 The Utah Federal Writers’ Project, “Utah State Guide Images of Green River and Quarrying Granite for the Mormon Temple,” USU Digital Exhibits, accessed April 20, 2019, http://exhibits.lib.usu.edu/items/show/18790.